Mathias Augustyniak and Michael Amzalag of the design agency M/M Paris has teamed up with Miu Miu again. The duo has reinterpreted the alphabet-based art they created for the brand's fall 2018 show in February — illustrations of female figures on white posters intertwined with graphic letters — as 3D set pieces with abstract faces projected onto them. The typography and sketches were extended to a capsule of white cotton poplin shirts, hoodies, and sweatpants called "Miu Type." Shoppers will be able to customize pieces from the collection at select Miu Miu boutiques. A season after her debut show at Miu Miu, Miuccia Prada left the rockabilly '80s aesthetic at home and instead went for a more traditional take on femininity. 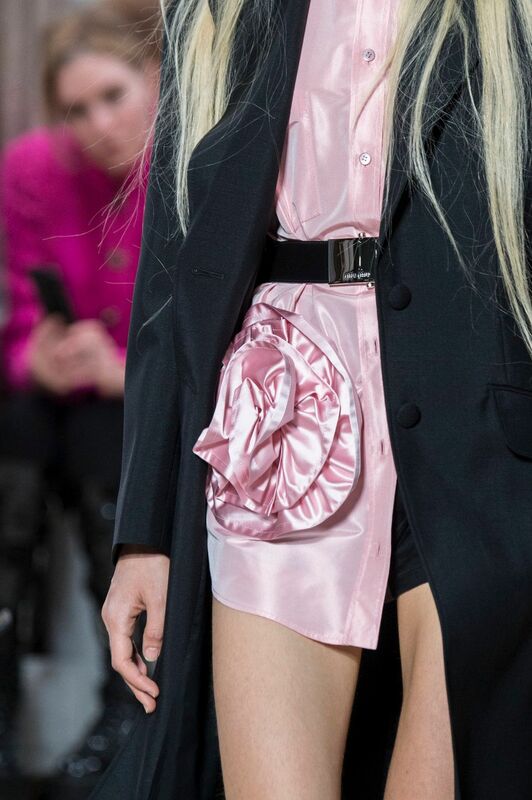 It was girly girl glam for spring 2019, with everything from knee high socks and rosette appliqués to ribbon and pearls making its way to the runway. 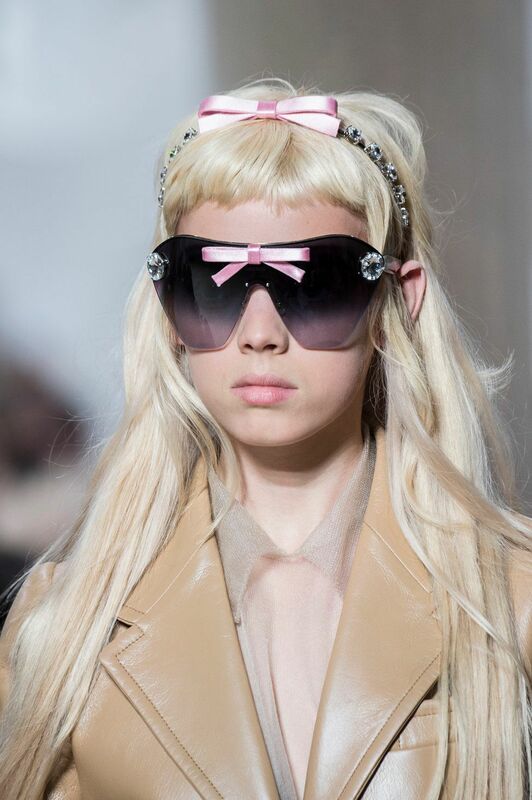 Fitting the ultra-feminine show, bows big and small covered the spring 2019 collection — some on sunglasses while others hung off dresses and shirts. Alongside them, denim and leather weaved their way through Miu Miu's show. From double breasted coats in rosy pinks and snakeskins and blazer skirt suits in leather to denim dresses and vests, Miuccia had something for everyone this season. Big, chunky platform shoes are back. Styled with knee highs, the high-heeled footwear was tweaked with a sophisticated touch as chunky heels were added to sandals and shown alongside the more traditional platform styling. A cascade of crystals were on the menu at Miu Miu's spring 2019 show. Little glimmering diamonds came attached to bowed headbands and massive rocks were applied to equally massive shades, while swaying strands of them hung off of ears, necks, and wrists. Only a year after announcing her retirement from the runway because of a foot injury, the gap-toothed supermodel took to the catwalk once again for Miu Miu. On September 21, a new Prince record titled Piano And A Microphone 1983 was released posthumously by the late musician's estate. 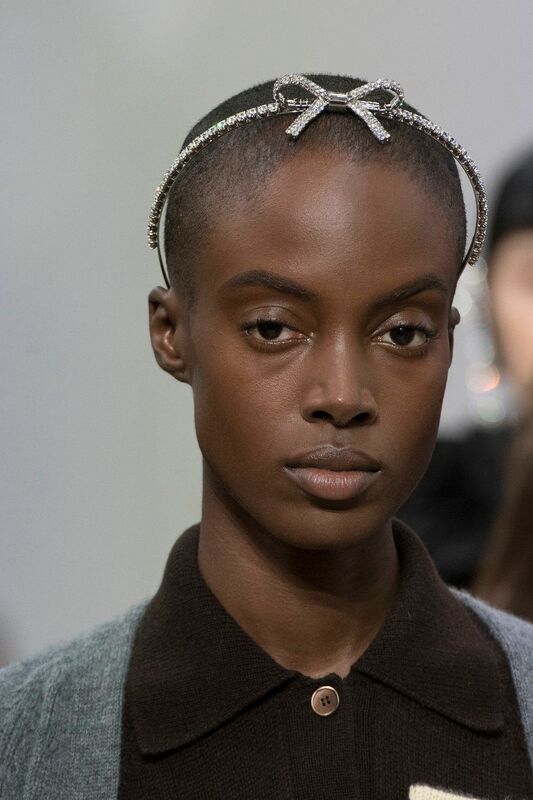 One of the tracks from the album, a soulful, home-recorded version of his 1984 song "17 Days," was a part of Miu Miu's show soundtrack this season.